This Level 3 vocational qualification has been designed to assess the skills and knowledge that are required to supervise ports and maritime operations. Valued by employers in the port industry, this is a standalone qualification that will enable learners to build on their experience. The primary purpose of this qualification is to confirm that the learner is competent to supervise safe and secure operations in a port environment. The qualification can be adapted to meet specific job roles in a range of port environments, from those dealing with bulk liquids through to containers and passengers. This qualification will provide confirmation to employers and industry, through on-the-job experience, that that learner has the skills and knowledge to operate as a stevedoring, marine, passenger or general supervisor in a port. The Level 3 Diploma in Supervision of Ports and Maritime Operations is based on the National Occupational Standards (NOS) for Port Operations. It has been developed in conjunction with Port Skills and Safety and the Maritime Skills Alliance to ensure it meets the needs of employers and that successful learners are ‘job ready’. The Level 3 Diploma in Supervision of Port and Maritime Operations will develop knowledge and skills in areas such as providing leadership for a team in logistics operations and promoting and maintaining health, safety and security in a port. Learners would also need to achieve a further 29 credits from the optional groups of units. These range from developing procedures to controlling risks to health, safety and security in ports to ensuring operational readiness of a port terminal, to co-ordinating and controlling vessel berthing operations. No specific qualifications are required to undertake this qualification. However, experience or knowledge of port operations would be an advantage along with a willingness to learn. General supervisor — with responsibility for ensuring the work of teams is carried out safely and to the requirements of the port. 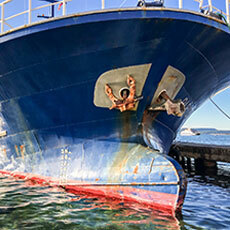 They may be responsible for the loading and unloading of cargo, the operation of harbour craft, safety within the port, and liaising with port and other customers. Passenger supervisor — liaising with freight customers, shipping agents, passengers, Border Force and harbour authorities — as well as supervising the team and working in the passenger terminal to ensure the work is carried out safely and to the requirements of the port and its customers. Stevedoring supervisor — with responsibility for teams of port operatives loading or unloading cargo ships, briefing them on their work, ensuring they operate equipment and machinery safely, and dealing with problems as they arise. ¨Marine supervisor — supervising the operation of harbour craft, and ensuring that port teams are working safely and that the area is safe to work in. On completion, learners can progress to relevant specialist courses such as Port Management or Health and Safety Inspection. Learners can also progress to the Diploma for Harbour Masters or a relevant Foundation degree such as Navigation and Maritime Science or Maritime Operations. Progression to a general Business or Management Foundation degree may also be feasible. To be awarded the qualification, learners must achieve a minimum total of 42 credits by completing: all three mandatory units (credit value 13) plus a minimum of 9 credits from Optional Group B; a minimum of 8 credits from Optional Group C and a minimum of 9 credits from Optional Group D. The remaining 3 credits can be achieved from Optional Groups B, C or D.
Please refer to the qualification structure (138 KB) for more information. Learners will need to demonstrate that they can work with others to ensure the port operates effectively and that equipment is operated within the relevant health and safety guidelines.